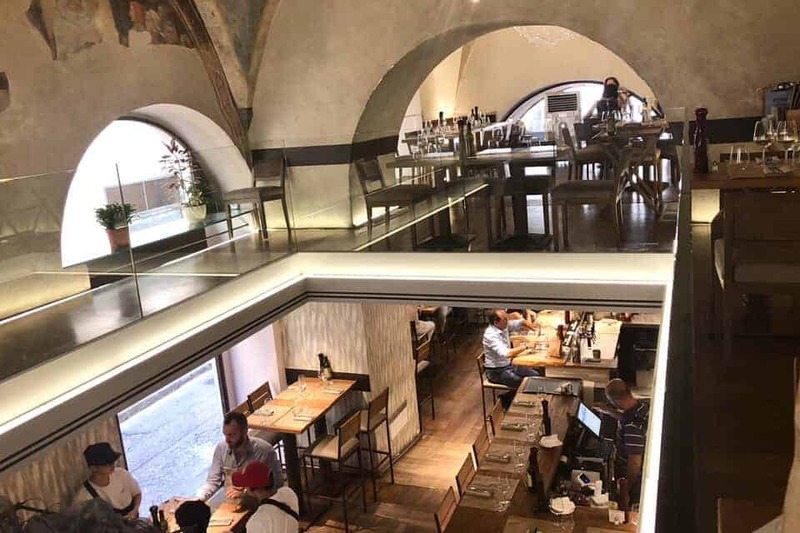 Searching for a brief respite from the pasta and pizza you find on every corner in Florence? Try Fishing Lab for a non-traditional seafood dining experience. Near the end of our stay in Florence, and while we were still sans kids during the day, we decided to try lunch at Fishing Lab. This is another hip, comfortable restarant by Bizionaire, the same restaurant group that created Foody Farm, which we also loved. We showed up as the first guests at opening time, 11am, hoping for an early lunch. But we were told upon arrival that they would not be ready for us for another hour, as they had a “big cleaning” to do from the day before. A minor disappointment, but not a big deal for us, since we had plenty of time. A server added a conciliatory reservation for us at noon, and we killed the next hour walking around the Duomo and the many shops nearby. When we returned at noon, we were seated upstairs on a narrow balcony by ourselves, directly above the sushi chef, and overlooking the entire restaurant. As the host started leading us up the stairs, we were concerned how hot it would be upstairs, given Florence’s current 90+ degree summer heat wave outside. We were relieved to find portable air conditioners upstairs that kept us cool enough that we forgot how hot it was outside. 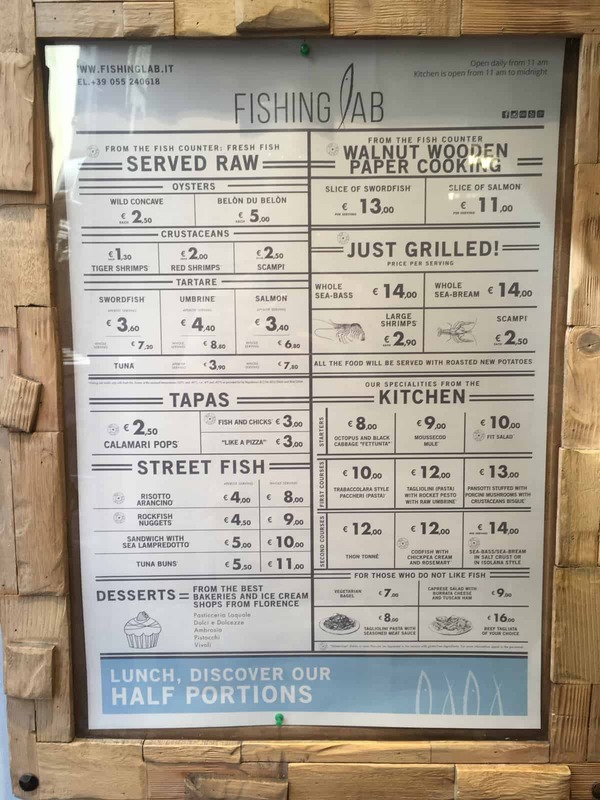 A good portion of the menu here was chopped up into tapas and street style portions. Coming at lunch time apparently makes it easy to order a sampling of several different dishes of smaller “half portion” sizes. 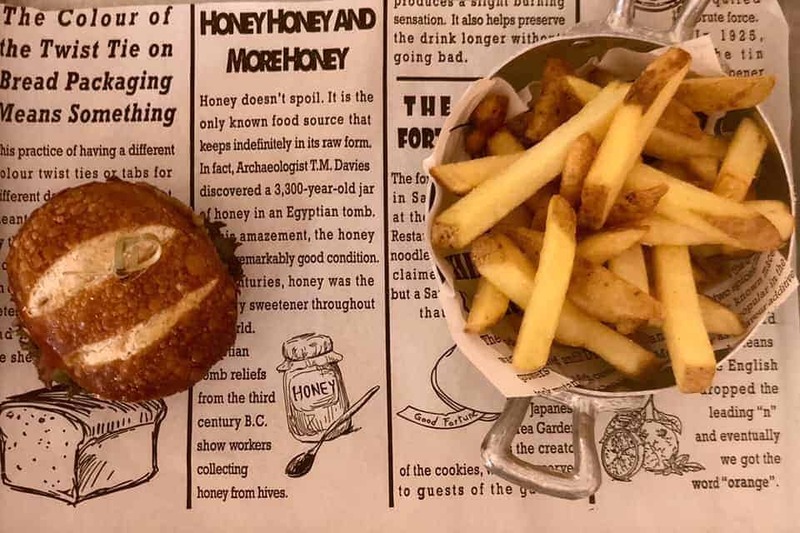 Options included oysters, crustaceans, fish and chicks (fish nuggets breaded with chick peas), and several variants of tartare, as well as several larger dishes like a whole grilled fish. Cam doesn’t really appreciate seafood much. Tho she will occasionally take a bite or two of some dishes I order. 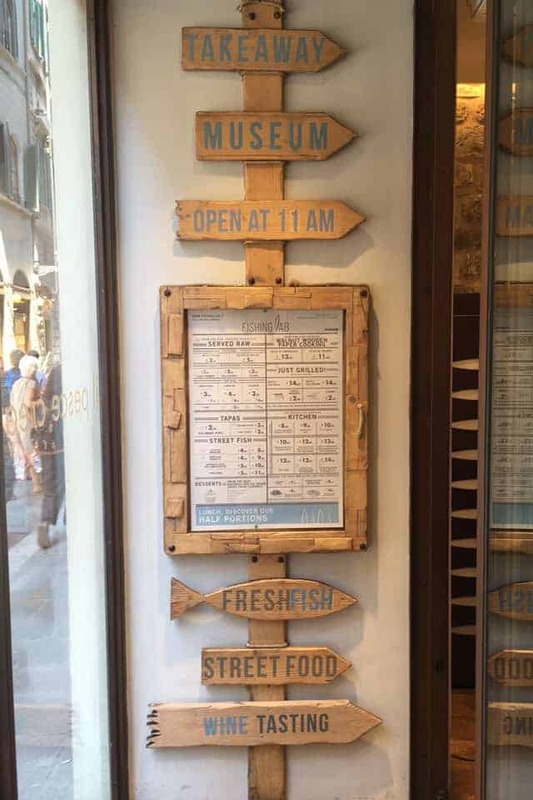 True to its name, the majority of the menu centered around all kinds of fish. 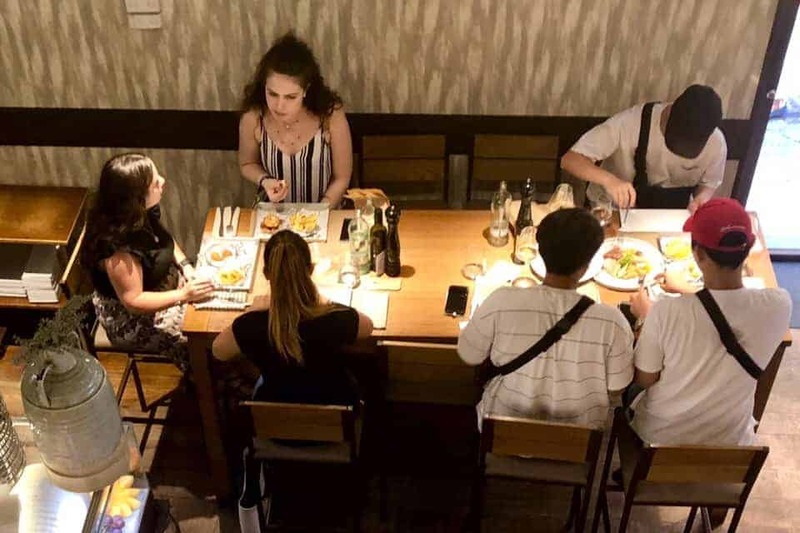 But a section of the menu toward the back offered a small selection of options labeled “for those who do not like fish.” This included a caprese salad with Tuscan ham, a vegetarian bagel sandwich, tagliolini pasta with meat sauce, and beef tagliata (grilled and sliced sirloin). She thought she ordered tagliolini, but ended up with the tagliata. Sad, because she was looking forward to the comfort food of pasta and meat sauce, and ended up with a rather chewy plate of bland sliced steak. I should have caught the red flag when our server asked her how she wanted the meat cooked. Neither one of us said anything. I’m a moderate seafood eater, meaning not too adventurous. I’m not a big fan of oysters and clams, though I’ll partake if they come for a large table of friends. And once, I nearly gagged on some sea urchin at a sushi joint in SF. But I love almost everything else. So my menu selections at Fishing Lab were exactly as I expected, and all rather tasty too. First up for me: Tuna tartare, half portion. Attractively plated with lots of color. 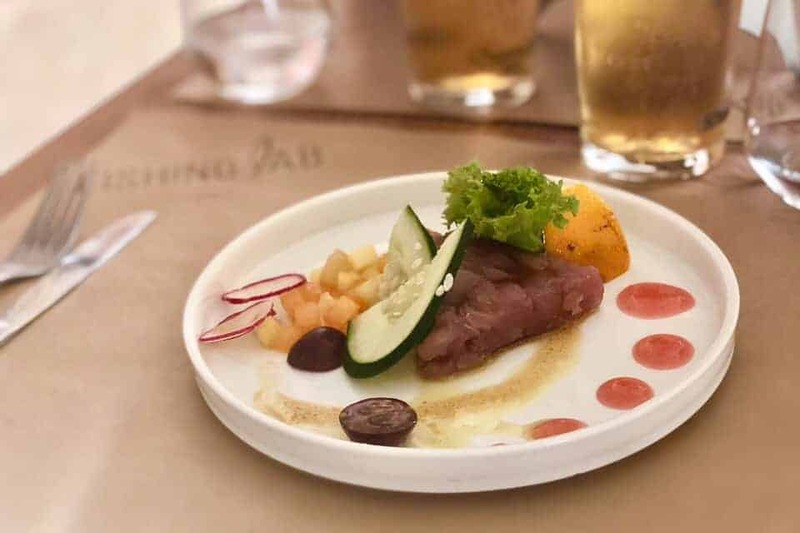 The tartare was soft, mild diced tuna, with tiny cubes of pineapple, melon, an orange and lemon wedge, wafer-thin cucumber and radish slices, decorated with what I could only guess were drops of watermelon purée. Very refreshing. This was easily my favorite dish, and the half portion was the perfect size to let me sample other menu items. Along with the tuna tartare, I had a small cone of perfectly breaded and fried calamari pops (equivalent in size to popcorn shrimp). The calamari could have used some more seasoning or even a dipping sauce to add some flavor. But I appreciated the texture contrast from the tartare. When Cam’s steak was delivered to our table, they also brought my tuna bun, also ordered as a half portion. This was a small tuna and veggie burger patty on a tiny pretzel bun (slider size) with caramelized onions, roasted red peppers, and honey mustard. Delicious. Crusty pretzel bun. Tho for some unexpected reason, the tuna burger was very greasy and quite drippy. Still good, despite the grease all over my hands. 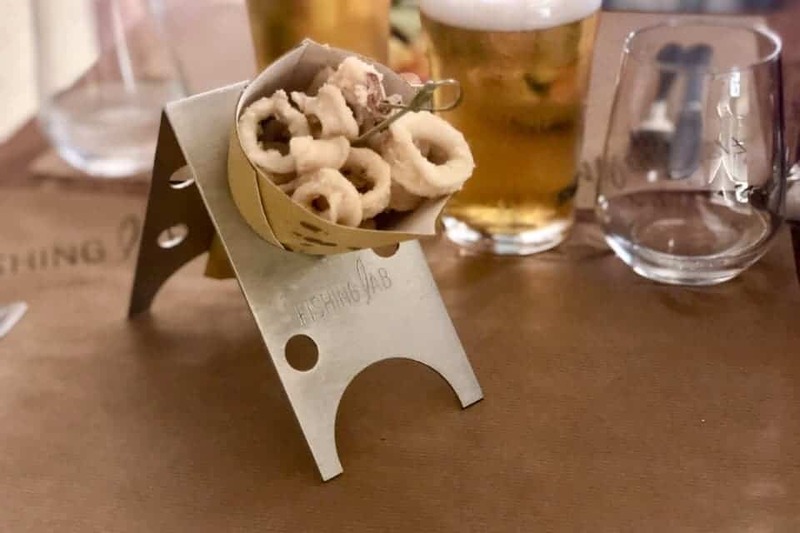 Served with small side of double-fried french fries. I can sometimes judge how much I enjoy a meal by how much or little I drink. I apparently enjoyed this one at Fishing Lab heavily, because I had barely downed any of the 0.4L of blonde beer and the extra bottle of sparkling water we ordered with our food. Cam would probably be hesitant to go back to this place. But this kind of makes sense, because she’s not really into seafood. And that’s what this place is all about. I, on the other hand, heartily recommend this place to anyone visiting or staying in Florence. Both Fishing Lab and Foody Farm buck traditional methods and expectations of Italy. So they both end up being nice breaks from all the amazing pasta and pizza you get every other meal here. I would seek out Fishing Lab for a repeat experience (possibly alone if need be) if I’m fortunate to return to Florence again. 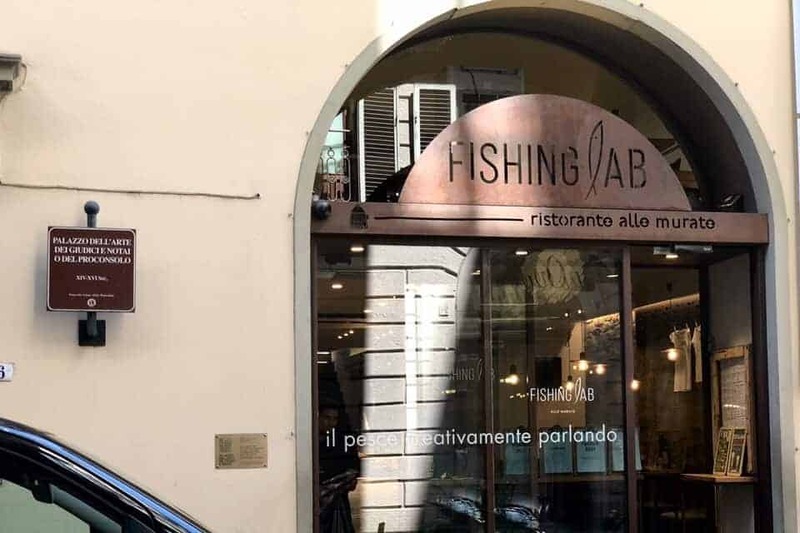 If you end up in Florence, and you love seafood, definitely try to fit in a meal at Fishing Lab. Designer, advisor, father. Still honing his craft. Little talk. Big heart. Disney geek. Giants fan.